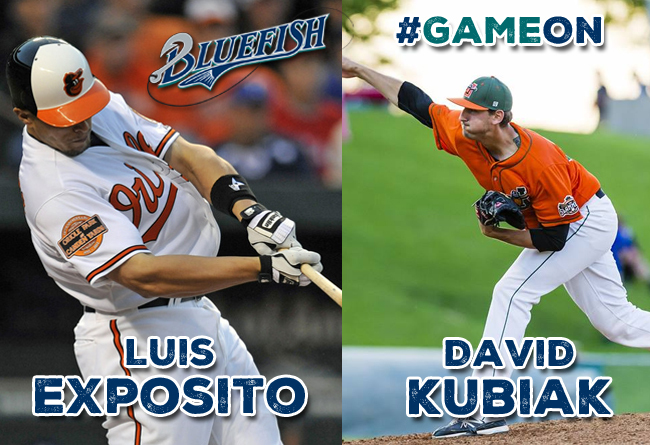 (Bridgeport, Conn. – Jan. 26, 2016) – The Bridgeport Bluefish today announced the signings of infielder Luis Exposito and pitcher David Kubiak. Luis Exposito comes to Bridgeport for his first season in the Atlantic League and tenth of professional baseball. In 2014, the former Major Leaguer split time with Toledo (Triple-A, Detroit) of the International League and Sacramento (Triple-A, Oakland) of the Pacific Coast League. He played in a combined 48 games, compiling a .228 batting average with three home runs, 12 RBI, and 18 runs scored. The 29-year-old made his professional debut in 2006 after being selected by the Boston Red Sox in the 31st round of the MLB draft. He spent seven seasons with the Red Sox organization, including a career year in 2009 with Double-A Portland of the Easter League, when he collected a .260 batting average, with 11 home runs, 39 doubles, 65 runs scored and 94 RBI in 125 games played. The Florida native reached the Triple-A level in 2011 and 2012 with Boston, before being traded to the Baltimore Orioles during the 2012 campaign. That same year he made his Major League debut, appearing in nine games with the Orioles. In 658 career minor league games, Exposito owns a .261 batting average with 63 home runs, 340 RBI and 295 runs scored. David Kubiak joins the Bluefish for his first season in the Atlantic League and fifth of professional baseball after being acquired from Joliet of the independent Frontier League for a player to be named later. Last year, the right-hander played for Joliet where he made 33 mound appearances, collecting seven victories with a 2.16 ERA and 92 strikeouts in 95.2 innings pitched. The 26-year-old made his professional debut in 2011 after being selected by the Tampa Bay Rays in the 36th round of the MLB Draft, appearing with two Rookie-level teams. The following season, he joined Evansville of the Frontier League, and in 2014 he played for Southern Illinois and Joliet, both also of the Frontier League. In 100 career minor league games, Kubiak owns a 17-11 record with a 2.40 ERA, 13 saves and 223 strikeouts in 199.0 innings of work. Before beginning his professional career, David attended and played ball at the State University of New York at Albany.